Are you ready for the Sunshine Coast beachfront accommodation that will knock your socks off? Check out The Breeze Mooloolaba, the Sunshine Coast’s newest and most distinctive holiday resort yet. 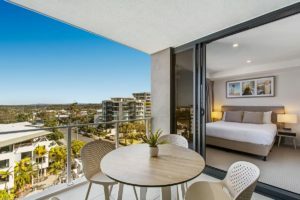 The combination of absolute beachfront location, easy access to Mooloolaba’s vibrant cafe and restaurant scene, and many boutique retail stores, not to mention the world class apartments means that all the ingredients for a great holiday are right here. The first thing you will notice about The Breeze apartments are the individually shaped balcony floor plates which have been designed as much for functionality as stunning looks. The balconies allow for maximum sunshine and light to enter your apartment and that of your neighbours above and below. Every apartment has light, and fabulous views of the Sunshine Coast and Coral Sea thanks to the floor to ceiling windows. 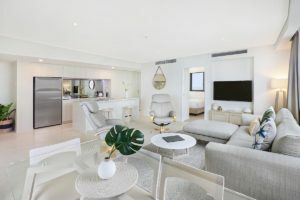 The holiday apartment experience is not complete without all the mod cons, which all apartments, whether you have chosen a one, two or three bedroom apartment, Foxtel, air conditioning, laundry and abundant free wi-fi are included. Not to mention the exciting chefs kitchen, with all the right appliances, utensils and work spaces there, ready for you to cook up a storm. If you don’t want to cook, why not BBQ down in the shared entertainment area downstairs. Nestled in the deliciously landscaped courtyard is the BBQ and heated pool area, complete with outdoor recliners and dining furniture. Another perfect area to enjoy your holiday, otherwise Mooloolaba has a world class selection of restaurants and cafes if neither option suits that evening. Undoubtedly you’ll want to spend time on Mooloolaba Beach. It’s ideal for families looking for a patrolled stretch of beach, and close enough to stroll to the gelato bar for something cold and refreshing. Why look anywhere else. 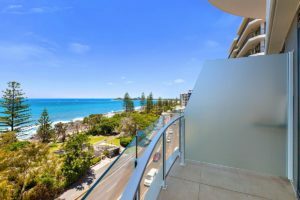 The Breeze Mooloolaba has everything you want from Sunshine Coast beachfront accommodation. Looks, location and superb liveability. You won’t want to leave. Book your Sunshine Coast holiday accommodation now.